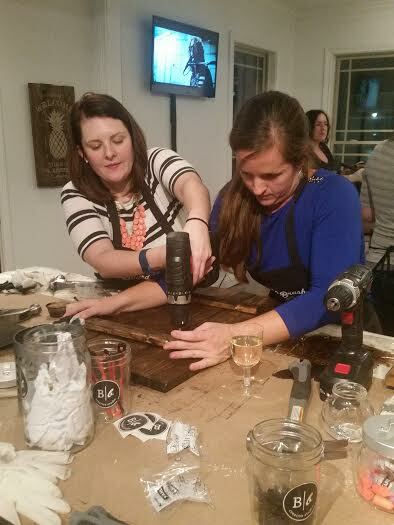 Last Friday the new Board & Brush Studio in Brownsburg was hopping with more than 20 women creating, hammering, staining, painting and having an overall fantastic time. I like to do as much research on stories for you as I can, mostly from the comfort of my pajamas at home, but this one I had to try out for myself. 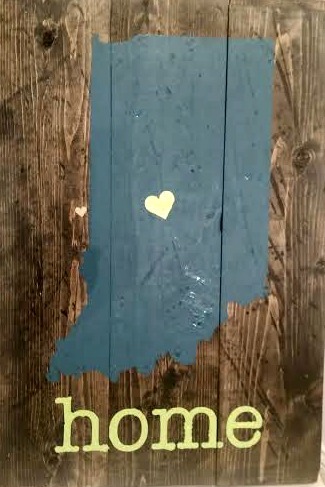 As I was scoping out the Board and Brush website, their project "Indiana Home" caught my eye. With 2016 being the year of Indiana&apos;s Bicentennial, I wanted to add this piece to my home in celebration. My thought was that I was going to walk in, throw some paint on a stencil and be done. But wow...it is so much more. 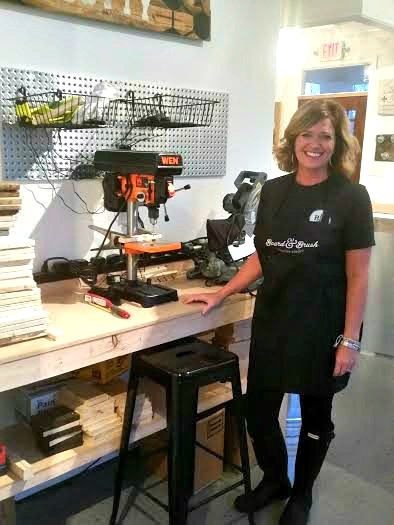 Upon arrival at the studio which is located at 442 E. Main St., I noticed a wall full of hammers, power drills, sandpaper, and any tool imaginable. It was a more organized version of our garage. I thought I may have bitten off more than I could chew, but the studio manager and instructor Debbie House insured our class she was going to go through the entire process with us step-by-step. Our work area was already organized for us with our boards and materials. First we sanded our boards, then earplugs went in as we all used different tools to distress them. I won&apos;t give away their secrets, but wow if you had a rough week, this is a great way to get any angst out! Our creative sides then got in on the action as we picked out our own stain and paint to make our signs as individual as we all were. What I truly enjoyed was seeing co-workers, friends, and neighbors coming together to help each other and have time to chat while the paint was drying. Debbie and her team of assistants were the epitome of "Hoosier Hospitality" as they helped mix paint, fix any errors, give advise and even refill drinks! It was the perfect end to a crazy week and a great way to start the weekend! Plus, we all took home a project to proudly hang in our home. Here are some other informational tidbits worth noting! The studio manager and her family are Brownsburg residents. When looking for studio space, many advised Debbie that she should head north of Indy. But she was persistent in opening one in Hendricks County! I love that community pride! For any class time, there are 3 different designs you can choose from. Although this location has only been open 7 weeks, classes are filling quickly. You can also get a group together for a birthday party, ladies night out or corporate event. Project choices are being added every month. There are many seasonal options as well as ones you can display all year long. Ready to get started? Head to their website and pick a class. You too, will be pleasantly surprised.